Reflecting upon my week in Cyprus I thought I'd share the stylish hats we created in just three days! The following hats have been made by European students and myself in Cyprus, on behalf of Grampus Heritage & Training. anything we had at hand! The women of Akrotiri have been basket makers through the years. We visited a traditional basket maker in the Cypriot village of Akrotiri. This traditional way of life is now endangered due to dwindling trade, and the traditional craft is at risk of disappearing. The baskets were once used in cheese making and for olive pressing along with other traditional uses,however plastic equivalents are now replacing these beautiful items. do not vanish all together and it is up to us all to help and support in any way we can. Perhaps finding new uses and purposes for the baskets in today's modern society, be it functional or decorative, is a way forward. After all the baskets would look perfectly at home in any traditional or contemporary interior and mass produced copies simply do not compair. Thank you for taking a few moments to see how we learnt about this traditional way of life and think how you might possibly help support their work. I have just returned from a jam packed week in Cyprus, staying in Limassol, working in Akrotiri and visiting Lefkara and Pafos! The week has allowed me to indulge in creativity and craft, learning about local skills and traditions….. Working with creative people from England, Scotland, Slovakia, Slovenia and Cyprus…. …All whilst guzzling Cypriot coffee with one or two ice creams, Scottish tablet, shortbread and other such delights! Really what more could a girl want?! Here are a few images from the trip to inspire and offer a flavour of Cyprus. Expect Sara Gadd Millinery to be influenced by the trip and watch out for further related posts, there’s simply too much to put into one post alone! I'm offically calling this month 'Millinery May'! Last week's article in the Cumberland News brought egar customers knocking at my door, each one hoping to find something stylish to wear at their spring weddings! Watch out for stunning ladies coming to a wedding near you! This season's fashion is hotting up with viberant colours, which in my opinion is a welcome injection of cheer in today's current climate! This week at Sara Gadd Millinery we have created an array different creations including a stunning butterfly hat in orange and magenta pink, a cream and gold tonal fascinator and a vintage velor bow headdress to name just a few! It's great to see people choosing to enjoy hats and headwear! Sara Gadd Millinery In The News! Fame at last! Check out the current news paper article in today's Cumberland News Paper! Romanian Students - Hat Making - Recycled Materials! Grampus Heritage and Training Ltd is a non-profit making organisation based in the North West of England. Since 1997 we have been involved in the management and promotion of European projects concerned with culture, heritage, archaeology and the environmen t.
Students created unique hats using recycled materials and found objects, their headwear will be worn for a fashion show, with costumes created in the same way! They have four weeks here to work and discover hidden heritage within out culture! On Sunday 3rd May my beautiful Mum & Dad celebraited their Ruby wedding anniversary with family & freinds! Fascinator Fun Workshops - Try Something Creative! These creative day workshops are great fun...go give it a try...you'll be amazed what you can create in a day! 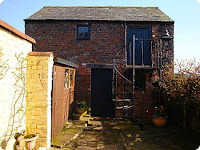 We are located in Corby Hill, 5 miles out of Carlisle. If you are coming to Cumbria for the weekend, we can provide advice on where to stay. Nestled between the Scottish Borders and Lake Districk there is plenty to see and do! 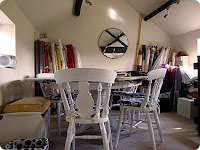 Visit http://www.saragadd.co.uk/html/news.htm to view the studio! So if you fancy having a go, If you are looking for a hat or fascinator, or would like to come and have a look please call to arrange an appointment and come to visit us!